Dec. 9, 2012: Every year in mid-December, astronomers look up in the sky and witness a mystery. It announces itself with a flurry of shooting stars. For several nights in a row, dozens to hundreds of meteors per hour cut across the glistening constellations of winter, each one a little puzzle waiting to be solved. "It's the Geminid meteor shower--set to peak on Dec. 13th and 14th," says Bill Cooke of NASA's Meteoroid Environment Office. "Although the Geminids come every year, we still don't fully understand them." Most meteor showers are caused by icy comets, which spew jets of meteoroids when they are heated by sunlight. The Geminids are different. The parent is not a comet but a weird rocky object named 3200 Phaethon. When 3200 Phaethon was discovered in 1983 by NASA's IRAS satellite, astronomers quickly realized that they had found the source of the Geminids. The orbit of 3200 Phaethon was such a close match to that of the Geminid debris stream, no other conclusion was possible. Yet here was a puzzler: Everything about 3200 Phaethon suggests it is an asteroid. In fact, 3200 Phaethon resembles main belt asteroid Pallas so much, it could well be a 5-kilometer chip off that 544 km block. "If 3200 Phaethon broke apart from asteroid Pallas, as some researchers believe, then Geminid meteoroids might be debris from the breakup," speculates Cooke. There is, however, another possibility: Perhaps 3200 Phaethon is a "rock comet." A "rock comet" is a new kind of object being discussed by some astronomers. It is, essentially, an asteroid that comes very close to the sun--so close that solar heating scorches dusty debris right off its rocky surface. 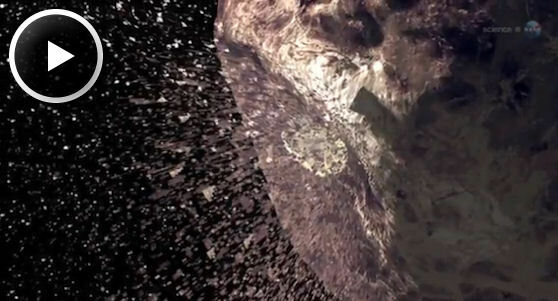 Rock comets could thus grow comet-like tails made of gravely debris that produce meteor showers on Earth. To test the idea, researchers turned to NASA's twin STEREO spacecraft, which are designed to study solar activity. In June 2009, STEREO watched 3200 Phaethon passing only 15 solar diameters from the sun's surface. What happened next surprised UCLA planetary scientists David Jewitt and Jing Li, who analyzed the data. " 3200 Phaethon unexpectedly brightened by a factor of two," they wrote. "The most likely explanation is that Phaethon ejected dust, perhaps in response to a break-down of surface rocks (through thermal fracture and decomposition cracking of hydrated minerals) in the intense heat of the Sun." So, according to the STEREO observations, 3200 Phaethon does behave like a rock comet. 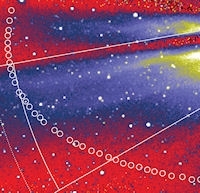 The “rock comet” hypothesis is compelling, but Jewett and Li point out a problem: The amount of dust 3200 Phaethon ejected during its sun-encounter added a paltry 0.01% to the mass of the Geminid debris stream, not enough to keep the debris stream stocked up with meteoroids for the annual display of shooting stars. 3200 Phaethon is not spewing enough dust to account for the Geminids. Could the rock comet have been more active in the past....? "We just don't know," says Cooke. Forecasters expect Geminid meteor rates to top 100 per hour when the shower peaks on the moonless nights of Dec. 13th and 14th, 2012. Cooke encourages sky watchers to go out, look up, and savor the mystery.